What do you get when you take a group of kids in school, a love of true crime, a pursuit of a real-life horror story, and a mystery, and combine them all in one movie? Well, what I was hoping I would get was a horror movie that became more of a mystery, telling the story of a real-life criminal through flashback and discoveries as the movie played itself out. 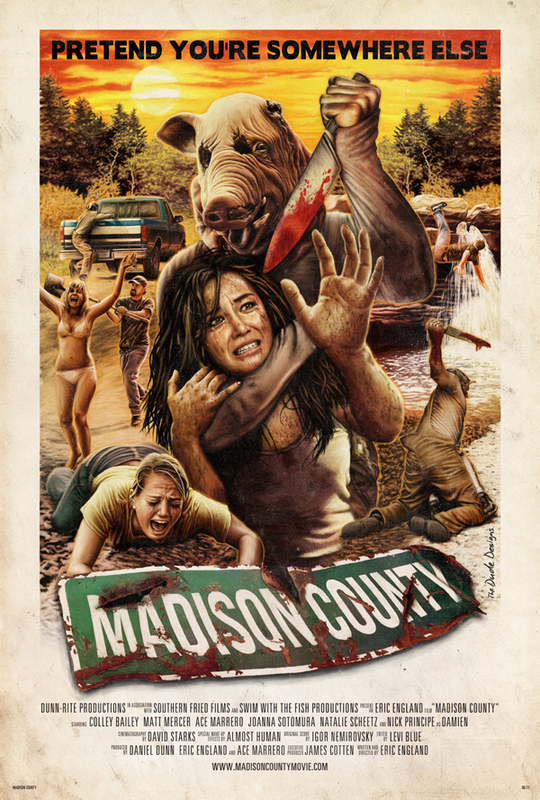 A movie that separated itself from other slashers by giving its audience more than just gore, and more than just the stereotypical backstory. In this way, Madison County was only half fulfilling. But such is the setup. James is a college student who read a true crime book about a serial killer, and it intrigued him to the point of him establishing a correspondence relationship with the author, deciding to write his thesis on it, and going to interview the author, whose address James says he found from the back of the book. Okay, pause. That’s the first sign of trouble. The fact that he was given the actual address to the home of the author, and not just some fan mail P.O. Box address? Super sketchy. And even more so when James also adds that this author doesn’t have an email address, a computer, or a phone. I mean, what is this, the 1800s? Maybe it’s just me, but that alone would make me nervous about communicating with the guy. But then they finally arrive in the town of the author, David Randall (and of Damien Ewell, said serial killer), and stop at a diner. Here we are introduced to what seems like a harbinger of impending doom (if you don’t get that reference then shame on you). Also, James and his friends receive information that would make any sensible person decide to cut their losses, turn around, and head back towards home and safety. But no. Because nobody in a horror movie can do what’s smart, or we wouldn’t have much of a movie—and because in the movies small town country folks are all stupid hicks in the eyes of anyone not from said town-- James refuses to listen to what he’s told in the diner, goes all macho, and insists that he and his friends proceed. And in doing so, he drags them into a huge mess. And that’s where the action begins. Murders start happening and James realizes he has made a big mistake. I can’t go into any more detail than that for two reasons: 1) I don’t want to give anything away, and 2) I’m still not sure I understand what the hell I watched. So instead I’ll just quickly point out what you should expect going into this movie. The movie is disappointing, in a small way, because many opportunities to make this a stand-out film were wasted. This should have been less of a slasher, and more of a mystery, as I stated before. Not enough backstory is given, until what little we are given is thrown at us in a confusing, half-assed way. There are too many red herrings, and I spent the whole movie going, “What the hell?” No satisfaction is given in terms of a plot resolution, and the movie raises more questions than it answers. That’s because it sets itself up almost as a mystery, but never really follows through on that. At the end of the day, mysteries get resolved, and this one really doesn’t. Only partially so. It tries to throw in a few twists, but they fall flat and are underwhelming. You can tell that the film is influenced and informed by famous iconic slashers, but it just feels like copying. The true crime element was so promising, but didn’t get included in any way that could have been beneficial to the film. And the digs at small town people/country life was annoying. So there’s all that. But still, I have to say that none of that means it doesn’t deserve to be seen. The film is entertaining, it’s intriguing, and it’s a good way to pass an hour and a half. I’m one of those people who never forgets that, despite all the artsy, film geek trappings that cinephiles like me can sometimes fall into, the ultimate goal of a movie (particularly a horror movie) is NOT to inform or be a life-changing experience, but to entertain. And Madison County actually does that.